Going to grandma’s house is always a treat, but one of the things I liked best about visiting my grandma as a kid was that she bought high quality ice cream. There was always at least one flavor of Snelgrove’s in her freezer. When I was little my favorite flavor was Canadian Vanilla, but as my tastes matured, I fell madly in love with their Burnt Almond Fudge. As is the unfortunate fate of too many beloved small companies, Snelgrove got bought out by Dreyer’s and eventually the brand was killed in 2008. I did my best to stock up, but you can only fit so many cartons into a college apartment freezer. Since then, I have longed to replicate my beloved ice cream. 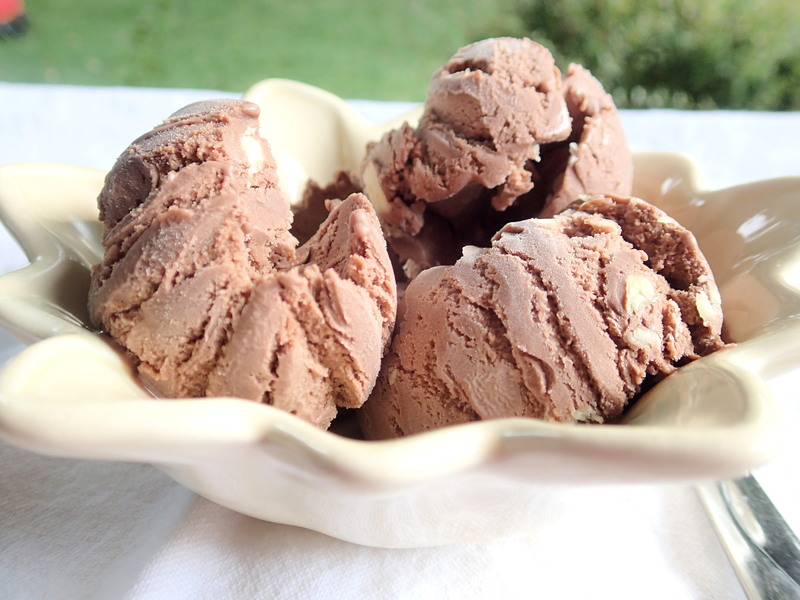 I’ve tried different recipes over the years, but it wasn’t until I tried Alton Brown’s chocolate ice cream as a base that things finally came together. The first time we made it in our nine-year-old ice cream maker that was purchased for $15 from a Dollar Tree type store. The poor machine was on it’s last leg and hardly produced anything solid enough to be considered ice cream, but it squeaked through one last time to bring us the flavor of Snelgrove’s. We recently had a three paycheck month (yay!) and purchased a new and amazing ice cream maker and made the ice cream again. One scoop in and I was transported back to 2008. Not only did it have the taste of Snelgrove’s, but the creaminess was spot on. It was hands-down, the best burnt almond fudge ice cream I have ever eaten. The recipe uses a lot of egg yolks, just a warning. It’s the perfect way to balance out all those healthy egg white omelets I know you’re eating! Mix the cocoa with 1 cup of the half-and-half in a medium saucepan over medium heat, whisking to combine. Add the remaining half-and-half and the heavy cream. Bring the mixture just to a simmer, stirring occasionally, and remove from the heat. While the mixture is cooling, toast your almonds. Preheat oven to 325ºF. Spread the almonds out on a rimmed baking sheet. Cut the tablespoon of butter into a few pieces and scatter over the almonds. Put the almonds in the oven. Check and stir them every couple of minutes. The almonds can burn quickly so don't neglect them! Once you've reached a satisfied level of toastiness, remove from oven and allow to cool. Once cool, chop and set aside. 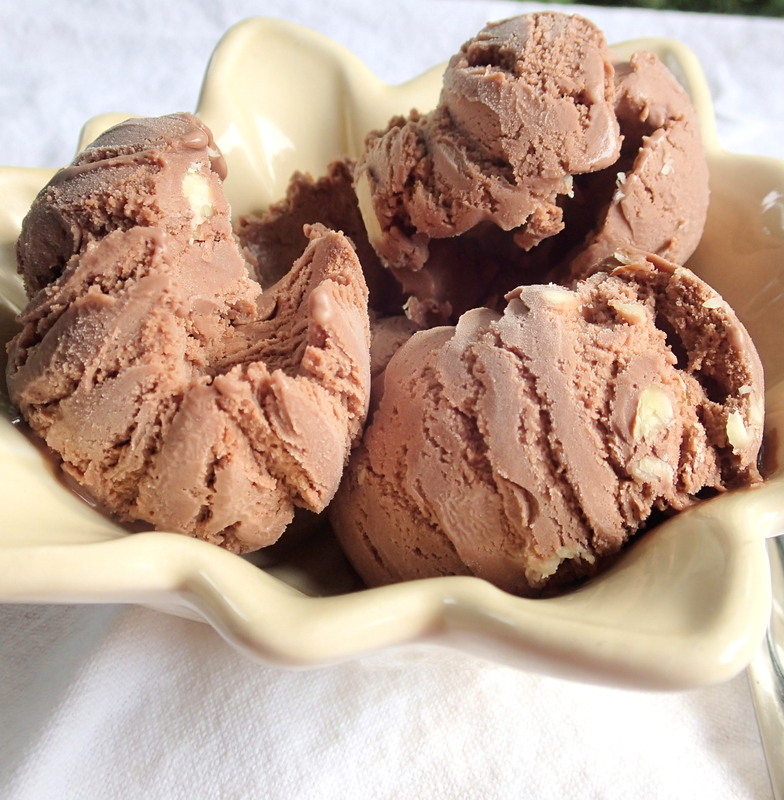 Pour the mixture into an ice cream maker and process according to the manufacturer's directions. 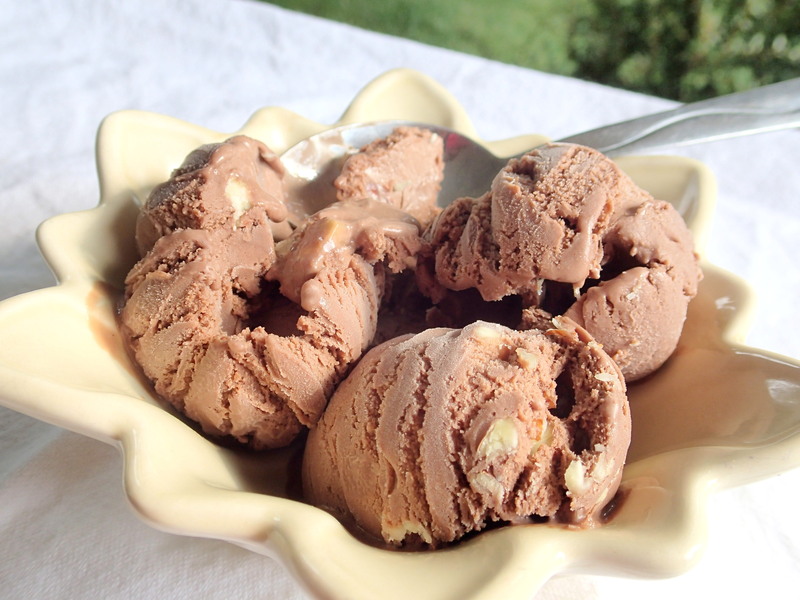 When the ice cream is almost done, add the almonds to the ice cream maker. Serve as is for soft serve or freeze another 3 to 4 hours to allow the ice cream to harden. Note: The base is an Alton Brown recipe and I'd strongly suggest clicking through and watching his short video on how to make the ice cream as it clarifies how and why to do things. The volume this makes is almost too much for our 1.5 quart machine. Beware that if your machine is that size you may want to reserve a small portion (1/4 C) of the ice cream mixture to avoid overflowing. Or if you're like me, be waiting with a spoon to make sure such a disaster does not happen.